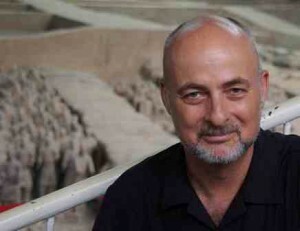 David Brin is a scientist, tech speaker/consultant, and author. His new novel about our survival in the near future is Existence. A film by Kevin Costner was based on The Postman. His sixteen novels, including New York Times Bestsellers and Hugo Award winners, have been translated into more than twenty languages. Earth, foreshadowed global warming, cyberwarfare, and the worldwide web. David appears frequently on shows such as Nova, The Universe, and Life After People, speaking about science and future trends. His nonfiction book—The Transparent Society: Will Technology Make Us Choose Between Freedom and Privacy?—won the Freedom of Speech Award of the American Library Association.